Jax was born too early. His eyes were fused shut. He couldn’t breathe without a ventilator. His skin was translucent and so thin it could rip. His ears were not completely formed yet. His arms and legs were like fragile twigs. Jax minutes after he was born. He’s wrapped in a plastic bag to help keep him warm. To give you an idea of scale, that is the nurse’s hand and index finger near his head. Having our baby boy at 23 weeks 3 days gestation was the scariest time of our life. We did not know if he was going to leave the hospital or not. So, we did the only thing we could do – we loved him. We sang to him and read to him. (Although, the first time I tried to read him a story, I started crying and couldn’t finish.) We touched him as much as possible through the incubator portals. And then something amazing happened: we were able to hold him! (I’m not sure if we were allowed to do this because Jax was getting stronger or because the nurses weren’t sure he was going to make it.) But when Jax was 14 days old, we did our first Kangaroo Care. Kangaroo Care is where parent’s hold the baby skin-to-skin. Our nurse placed Jax, clothed only in a diaper, on our chest and then covered him with warm blankets. This was an extremely big deal! It took at least two nurses and a Respiratory Therapist to make the transfer from isolette to our arms. It usually took about 20 to 30 minutes to get Jax prepared for the big adventure. 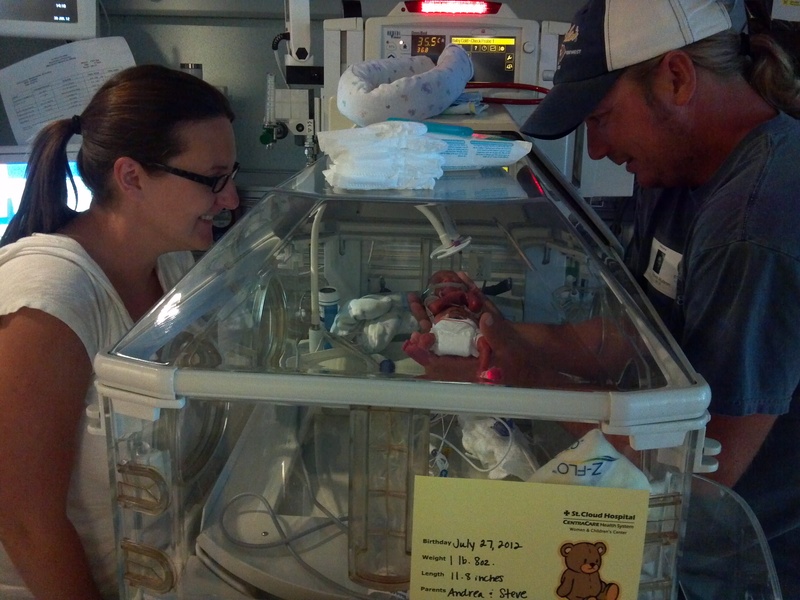 The nurses would untangle all his wires, make sure the ventilator was secure, and check him for signs of distress. Then once we got him in our arms, they had to make sure his airway was open and that he was getting enough oxygen. The most important part was making sure his ventilator tube was in the correct position; they would tape it to our arm or the chair to make sure it did not move. We could not move or change position at all when we were holding him – the slightest movement could kink the tube and cause a spell where his heart rate would drop and his oxygen levels would plummet. Spells happened quite a bit at first – trust me, holding your baby while you watch them turn blue is not a very pleasant experience. But. The positive aspects far outweighed the negative. The doctors recommended that we hold him for at least one hour at a time to give him a chance to complete a full REM sleep cycle. After he got stronger, we were able to hold him for as long as we wanted! Not only did Jax respond extremely well to Kangaroo Care time, but it was also healing for me and Steve. We felt more “in charge” of our baby. We were able to bond and connect with him. We were able to give him kisses. We were able to feel his tiny body, his wiggles, his breath, his heartbeat. We were able to connect with him in a way that was impossible to do through the plastic walls of his isolette. We believe deep down in our hearts that Kangaroo Care helped Jax live. Unfortunately, throughout our journey, we’ve learned that many parents don’t have the option of Kangaroo Care. Many times, it’s because the NICU policy prevents parents from holding their tiny or sick babies. Other times, parents did not know to ask for it and they were not offered it by their nurses. I’m so sad to know that there are scared parents and babies out there that don’t get the benefits of healing touch! It is my hope that eventually all NICUs and hospitals will embrace healing touch and Kangaroo Care as viable and important medical treatments. If you had a baby in the NICU, were you given the opportunity to do Kangaroo Care? Were there restrictions on how much and how often you could do it? Did you have to ask to do it or did your nurses offer it to you? I’m curious about your experiences with Kangaroo Care! Will you share your story with us in the comments? So moving and such gorgeous pictures. I feel so lucky that we enjoyed the benefits of kangaroo care but, like you, so sad that others aren’t given this option or don’t know to push for it. I think today amd posts like yours have been great for raising awareness, though. I saw so many great posts (like yours) today about the benefits of Kangaroo Care. Hopefully the word keeps spreading and more babies and parents can connect skin-to-skin! In honor of International Kangaroo Care Awareness Day, I’m reposting this…Kangaroo Care was instrumental to Jax’s care in the NICU. For three months, we spent the better part of our day skin-to-skin! In the coming weeks, look for a post about using mindful, healing touch in the NICU. My micropreemie was 22 weeks, 4 days and she recently turned 13! We did kangaroo care once she was stable enough, which wasn’t until she was 7.5 weeks old. I did it as often as I could if/when she was stable. I still can’t believe she fit between my chin and breasts at that time! My hubby did it a few times…oh could she grab his chest hair! LOL! Hi Julie – Congratulations on your 13 year old! What an amazing miracle. I’ve been reading a lot lately about the “edge of viability” and how for many hospitals that is 23 weeks. Your daughter is proof that younger babies can thrive, too! I’ll bet your hubbie loved getting his hair pulled by his little one – what an awesome memory for him. I still have a hard time believing how small Jax was and how his feet didn’t even come close to touching my belly button – crazy! How much did your little miracle weigh when she was born? Hi! I’m an ICU nurse (Canada), volunteer lactation mentor/coach(trained in advanced techniques, breastfed 4 kids) and product developer. 4 months ago, at my hospital craft show, selling my nursing ponchos, baby slings/wraps, I was asked by NICU charge staff/lactation doctor to come up with a new product to secure the pre-term baby to the parent’s chest during kangaroo care sessions. Two days later my UCHI neonatal Kangaroo Care wrap was born. Check out my Facebook page UCHI or visit my website http://www.uchimama.net for link (top right page). My US patent was just filed last Thursday. I have given away samples to 8 hospitals in Canada and 1 in England and will be taking the USIKC course(kangaroo care certification) in early June where I’ve been asked by the course organizer to bring several samples. My wrap will be very low priced compared to 160-250$ garments which don’t even allow access to lines from the sides and which do not support the baby (baby could slide out). It classified as a medical device with Health Canada (verified and filled out the forms). I am looking for parent-preemie dyads for pictures/film in the US where most hospitals (85%) have a kangaroo care policy in place. In my country;the government/neonatologists are pressing for kangaroo care but nurses and nurse practitioners are reluctant to use anything on mom/baby even though it is the standard elsewhere in the world. Most units are simply shelving the sample, scared to actually do anything with it until they are instructed to do something with it. It is very hard to change routine and staff resistance/non compliance are the biggest factors in whether kangaroo care is allowed or not in an NICU. I was asked to come up with a garment/wrap because nurses were concerned laying the baby on the parent’s bare chest with tubes taped to upper chest was unsafe). Any help or advice would be appreciated. I plan on sending samples to Uppsala hospital in Sweden, considered the leaders in kangaroo care (where incubators are hardly used and 24 hour kangaroo care is the standard along with telemetry and portable ventilator equipment). Mariela, Good work! I can understand the trouble you’re facing – change is very hard for people! And the nurses just want to be safe. It’s frustrating, though, when some of them don’t understand the benefits of Kangaroo Care! During our hospital stay, we wanted to pick our son up from the isolette and then sit down with him so we would bypass the nurse handling him, too. Some nurses were very receptive to this new way of doing things and saw how much more comfortable Jax was because he wasn’t being as jostled as much. But other nurses refused to do this with us because “that’s just not how we do it here.” They were scared! The more we talked about it and the more we worked with the nurses, we were able to convince them to give it a try. I think education and compassion is the key. Let me know how your product launch in the US goes – it sounds like it might help a lot of families become more comfortable with Kangaroo Care. Thanks for your reply and support. One of my product reviewers recommended my wrap to the hospital in Georgia where her baby was born prematurely and talked to her parent liaison worker about me. I’m curious to get feedback from them. I’m excited about the course next week (May 31-June2 Cleveland). I made myself a tee shirt with photos of my wrap in use (front and back) and wore it at two major airports this month, lots of people stared and some asked about it. I even got a hug and a thank from a waitress who was touched by my invention. At 10 days old, I got to hold Dalton for the very first time! Never in a million years is this how I would have imagined “snuggling” my newborn baby for the first time….but I will always cherish the sweet memories of having my 1lb 7oz baby boy laying on my chest, “high satting” & peaceful!! There is not one doubt in my mind, that Kangaroo Care helped our lil boy thrive and grow. Even now at 6 1/2 lbs I still sometimes opt for Kangaroo Care over swaddling him….and I am sure I will continue it even after he is home. Kerri – it’s so amazing to see our little ones positively respond to the healing touch! “High statting and peaceful” is a NICU parent’s dream come true. Way to go Dalton! We did Kangaroo Care when Jax came home for a while. Although, now that he is older, he doesn’t seem to like it as much. I guess he’s already becoming an independent little boy! I held Jack for the first time when he was 11 days old and just extubated (and on C-Pap). After that day, I held him as often as possible and for as long as possible, during his 112 day stay. They started to call me Madam Kangaroo and one of the NICU docs said, “That’s where all our babies should be” as he pointed at me (while teaching some students). It amazes me when I hear about NICUs that don’t encourage or allow KC. I also believe it is what saved Jack and helped him thrive! Madame Kangaroo – I love that! 🙂 The doc was right – that is where all the babies should be. I’m so glad you had the opportunity to give Jack this healing touch during his hospital stay. And now look at him all big and stuff!! Previous Previous post: “Graduation” Day!